Strong candidate for worst poster of the year. Hugh Jackman looks like the love child of Chris Pine and Freddy Krueger for starters. The Pitch: X-Men: Days Of Sideburns And Flares. The Review: I was never much of a comic book reader as a child, other than traditional British fare like The Beano and The Dandy. It wasn’t that the concept of comic books didn’t appeal; far from it, as I spent large chunks of my adolescence in comic book stores, I was just there for the latest TV and film merchandise from my favourite franchises. Comic books always felt somewhat alienating for their complex universes, and I never felt comfortable attempting to pick up in a franchise that had sixty years of back story. Slowly but surely, the film franchises are heading the same way, and the Avengers and X-Men series are both at a point where coming in fresh to the franchise will prove alienating and frustrating. For those keeping score in the XMCU (X-Men cinematic universe, as probably no-one apart from me is yet calling it), the tally is so far one decent, one amazing and one muddled film in the original trilogy; one dire and one passable Wolverine spin-off; and one fun, fresh and revisionist take on the younger versions of the characters that seemed almost impossible to reconcile with what we knew was to come. Undaunted, many of the key players in both the franchise’s high and low points behind the scenes have returned to attempt to draw these plot threads and characters together in a single film. In theory it’s a simple premise: Kitty Pride (Ellen Page) has been using her powers to send someone’s consciousness back a few hours and use the future knowledge to help win otherwise impossible battles with highly advanced, adaptive robots called Sentinels in an era when both humans and mutants are all but extinct. Deciding the only way to win the war is to stop it before it starts, the franchise’s own odd couple Professor X and Magneto (Patrick Stewart and Ian McKellen) decide to send someone back using Kitty’s power, but only Wolverine (Hugh Jackman) can survive the trip. Once back in the Seventies, he must stop Mystique (Jennifer Lawrence) from killing Sentinel designer Bolivar Trask (Peter Dinklage), but will need to get younger Charles and Erik talking first (James McAvoy and Michael Fassbender). If that paragraph didn’t make a lick of sense to you, I suggest you give up now and turn back. Those also expecting detailed explanations at how the future mutants have either regained powers or survived should also lower expectations now. While many of the film’s set-pieces can be enjoyed on their own – especially the opening future battle showcasing a host of new mutants with exciting powers and no time to get into their character traits, and the standout scene with new super-speedy mutant Quicksilver (Evan Peters) and a Pentagon break-in – whether or not the character arcs stand up on their own is more debatable. In terms of development, there are only three characters who get any serious work: once again, the focus is on young Magneto, Xavier and Mystique. Fassbender continues to exhibit the same directness as McKellen did, while Lawrence is a mass of whirling limbs and is in blue more often than not. The standout this time is McAvoy, who gets to explore his own evolution more thoroughly and his struggle on whether or not to use a drug created by Nicholas Hoult’s Beast to enable him to walk at the cost of his powers carries the most dramatic weight. Pretty much everyone else is a cypher, even Jackman as Wolverine who here is little more than a plot device who gets to react to the latest dramatic development. The biggest waste has to be Peter Dinklage, effective but woefully underused in the rush to give everyone a line of dialogue or two. With even minor mutants from the original trilogy and First Class populating the background, some of whom I didn’t even remember on first watch, there is an occasional feeling of the plot straining at the seams under the sheer weight of mutants. You may be too entertained to care, as Days Of Future Past rattles past at a fair old lick, and Singer directs with the same flair he brought to the series high of the first sequel. I also hope you’re not too attached to the original trilogy, as by the time the dust settles it’s unclear how much of them even happened in this new timeline, but in this case if you’re thrilled by this instalment, it’s probably enough. The USP, and strength, of the X-men series has been their service as an analogy for any groups suffering segregation, abuse and injustice, and while these themes are still at play, they’re slightly more to the background here and DOFP is more action movie, first and foremost; that’s no bad thing, as there are only so many times you can wheel out the same moral or message before it feels stale. Where many other comic book franchise episodes feel like they’re biding time before the next chapter, this X-Men movement has substance and feels pivotal while still leaving you wanting to watch the next in the series. It’s to the credit of all involved that there still feels plenty of life in this franchise, but let’s hope the coming Apocalypse can thin out the X-roster a little and keep the series relatable. Why see it at the cinema: It’s another big Hollywood mash-up, and with a decent supply of humour and some epic visuals – as anyone who’s seen the trailer will testify – the cinema is the sensible choice to get the most out of this one. Why see it in 3D? The two main issues for any 3D film are both related to seeing what’s going on clearly. In terms of editing, Singer favours long takes and steers away from choppy editing, and in this sense the third dimension works well. Much of the future setting, though, is very dark and although I could always work out what was going on, sometimes I was straining hard to see everything. What about the rating? Rated 12A for moderate fantasy action and infrequent strong language. I’d hate to be a director of a major studio tentpole knowing that the best you can aim for is “moderate”, but as moderate films go, no complaints here. 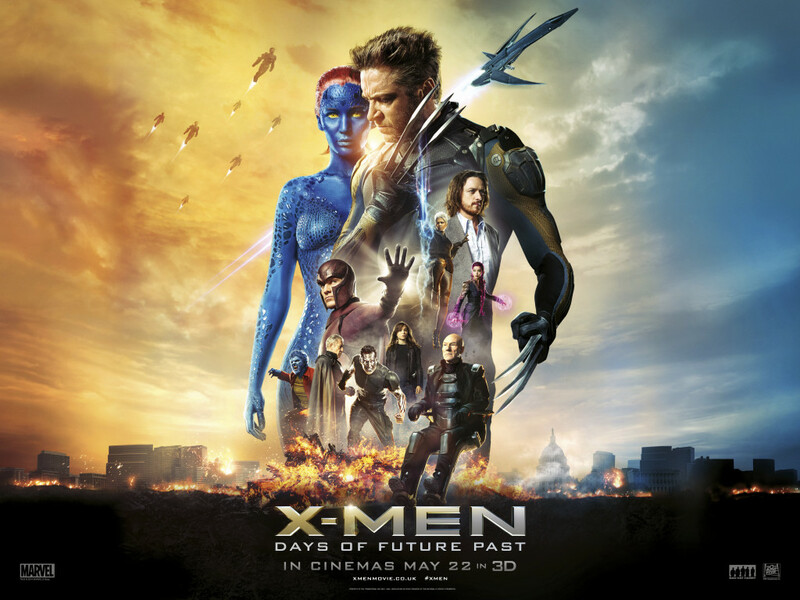 This entry was posted in Reviews and tagged 2014, Bryan Singer, film, Hugh Jackman, James McAvoy, Michael Fassbender, movies, review, X-Men: Days Of Future Past.